So, you are thinking about taking your holy vows? You have talked to the matron at the church, and she said to think about it, because it is a huge decision to make. She said try acting like a nun, just for a few days, just to see what it is really like. That is a great idea! That way you can see what it would be like to live as a nun BEFORE you take the sacred vows before the Father, the Son, and the Holy Spirit. Only, you don’t have the head dress that classic nuns wear. Well, fear not! We have just the thing to make your nun impersonation feel a little more authentic. 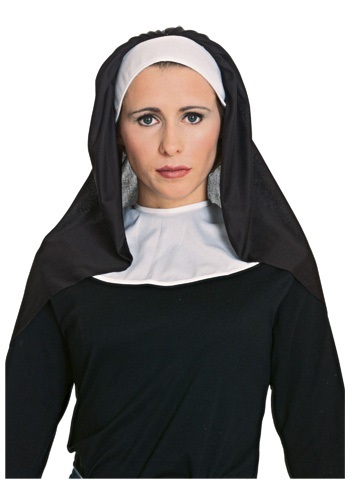 This Nun Accessory Kit will make you not only FEEL like a nun, but look like one too. This way you will know how everyday people will treat you, and will then be able to make a more informed decision about your potential future lifestyle. Just don’t forget to say a few "Hail Marys," and a couple of "Our Fathers", and maybe a "Glory Be" thrown in for good measure. THIS WAS GOOD FOR THE PRICE AND I RECEIVED ALOT OF LOOKS AND COMPLIMENTS. THE PRICE WAS WONDERFUL AND JUST WHAT I NEEDED SINCE I AM A EVANGELIST IN MY CHUCH.